(L to R) Scott Downer, Brian Miller, Jerry Womboldt, and Jo-Anne Perkins of Cascade Cart Solutions are given special recognition by DEQ Recycling Program, presented by Emily Freeman Recycling Specialist. Cascade Cart Solutions was selected for special recognition by the Michigan Department of Environmental Quality’s Recycling Program. Cascade has worked diligently to become an outstanding partner to the DEQ and many Michigan communities, recognized for consistently going above and beyond to help increase recycling across the state. 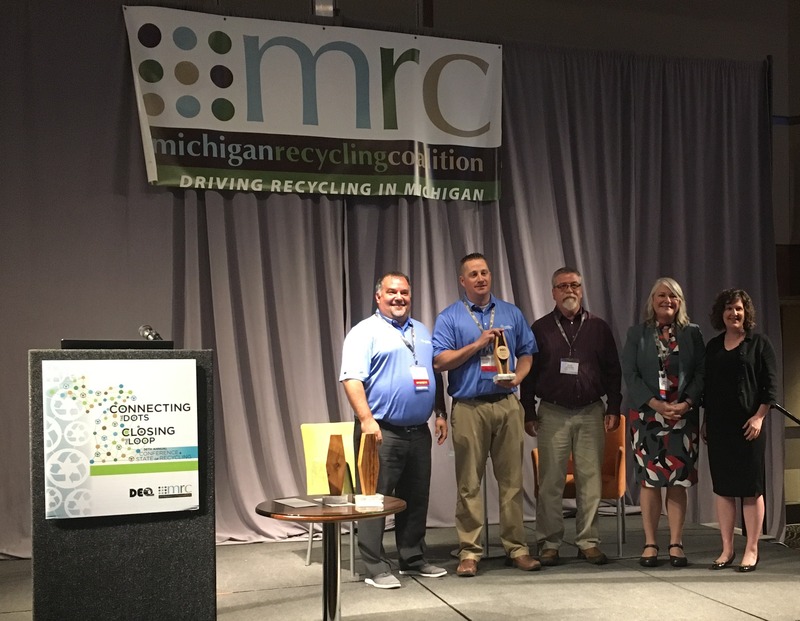 "Starting a new state-wide program is a challenge – and it’s been possible only through support from committed partners like Cascade Cart Solutions," said Emily Freeman, MDEQ Recycling Specialist, while presenting the recognition at the Michigan Recycling Coalition's Annual Conference.